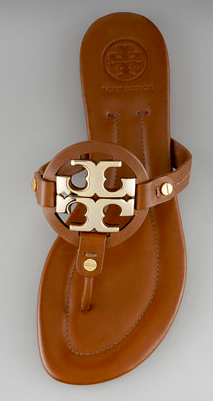 I have always been a fan of Tory Burch, from their signature sweaters to the Reva flats you see everyone wearing. The style is comfortable, classy and always appropriate. While Tory Burch is predictable in that they don’t change up their line too much each season, they always have what I need when I go into the store (plus their stores are always so attractive and fun to visit!). Below are my faves from their online boutique – I’m feeling a 70’s vibe this spring and summer as I have seen it a lot on the runway for fall and in the newer lines coming out now. Anthony Hoodie – $325 – we love the retro look of this beach hoodie; great to pair with jean cutoff shorts and a pair of sandals for a relaxed coverup! Miller 2 Sandal – $225 in Almond/Gold: the next generation Miller sandal that everyone loved, with the added gold-plated Tory logo for a glamorous take on the original! Brigitte Mini Dress – $278: this denim dress is modest enough for casual Friday’s at work but can turn into a stylish frock for happy hour or dinner if you just pair with a bright bag and espadrilles! High Waisted Flare Jean – $195 in Cornflower: these pants are outrageously cool! We love how bold they are and would pair them with a white tank or billowy white blouse and belt with espadrilles – the ultimate summer look, with just enough pop!